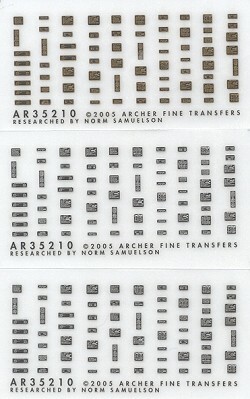 The next in the latest from Archer Fine Transfers is this set of Generic Placards. These come with three backgrounds; brass, white and aluminum. You'll find these placards in just about all US Army vehicles as the Army assumes the operators and maintenance personnel are stupid and need to have such things as the shift pattern, the proper tire pressures and such are properly placarded. While these sets are designed for US Army vehicles, they can be used on a variety of other things, such as aircraft, as they are not easily read so will work quite well on things like struts and interiors. A nice variety of shapes ensures that you'll be able to find a use for these somewhere. If you've never tried dry transfers, you are missing on a real boost to the look of your model. If you still want the ease of waterslide decals, you can apply these to clear decal sheet and go from there. As you can see, these are available in either brass, white or aluminum backgrounds for your particular application. Thanks to Archer Fine Transfers for the review samples.